DailyTech points out that newly leaked Intel roadmaps suggest that the chip giant has delayed its 14nm Broadwell processor in favor of a 22nm Haswell refresh in 2014 (and Haswell-E towards the end of the year). Much has already been published about Ivy Bridge-E, but the VR-Zone piece deals with its architecture-refreshed successor, Haswell-E. 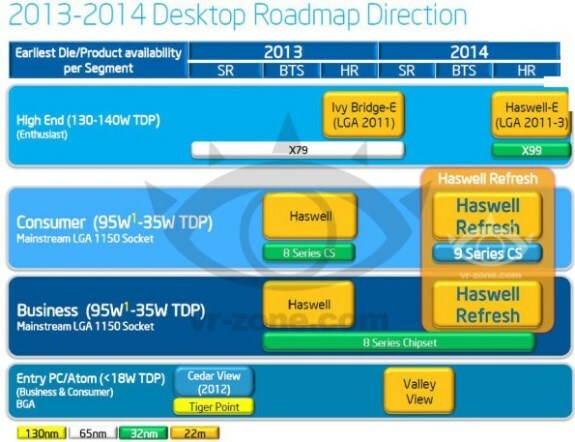 The leaked slides seemingly confirm the timeline of the previous leak, indicating that Haswell-E chips won't be available until sometime late next year (H2 2014).